In this site there was the Church of Santo Stefano "of the people" which is mentioned already in 960 when it was sold from a private to Willa of Tuscany mother of the Marquis Ugo of Tuscany who gave the order in 960 to build the Benedictine abbey called Badia Fiorentina. 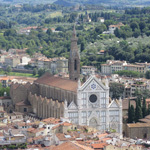 (badia means abbey). The abbey was founded in 978. 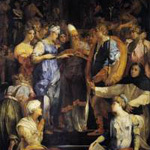 Ugo, become Marquis of Tuscany, increased the donations of his mother with great munificence. In 1285 the church underwent a radical rebuilding in Gothic style by Arnolfo di Cambio, who changed its orientation with the apse towards via del Proconsolo. 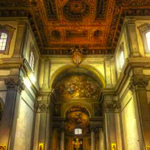 The church had three naves and its appearance was very colorful: it had a coloured ceramic floor, older than today's baptistery, and which still survives beyond today's coffered ceiling; moreover, he had begun to decorate his fresco walls. The church is also linked to Dante's memories: here, Dante Alighieri saw Beatrice Portinari for the first time, during a mass. Later Boccaccio held the famous readings of the Divine Comedy in this church. The cuspidate tower with hexagonal base (1310-30) is a famous point of the city profile and stands between the towers of Palazzo Vecchio and Bargello. For centuries its bells have punctuated hours throughout the city. In 1307 the bell tower was demolished in half to punish the reluctant monks to pay a city tax, but it was however restored early in 1330. Its current height is about 70 meters. In the following centuries, the Benedictine abbey saw periods of decadence alternating with periods of renewed splendour. 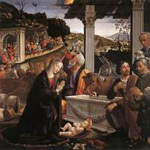 Numerous Renaissance-style works of art embellished it: in addition to the sculptures of Mino da Fiesole and Bernardo Rossellino, the Art of Judges and Notaries which had its headquarters in the nearby building in Via del Proconsolo and sometimes used the abbey for meetings and public functions, had commissioned the great Masaccio for frescoes. The interior of the church, further transformed also in the eighteenth century, presents an overlap of styles and structures. 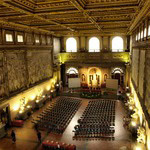 The hall is dominated by a sumptuous carved wooden ceiling, built by Felice Gamberai (1631). 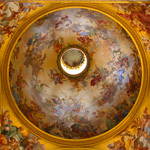 On the left wall, above the monument to Ugo of Tuscany, in the choir is preserved the valuable canvas of the Assumption and saints by Giorgio Vasari (1568). Despite the changes undergone over the centuries, the Abbey has kept intact within the complex the charming Cloister of the Oranges built between 1432 and 1438 by Bernardo Rossellino. On the upper floor of the cloister there is a cycle of frescoes on the life of St. Benedict. At the moment it has again the function of a monastery with the arrival of the religious Community of the Monastic Fraternities of Jerusalem.